In 2007 something happened which changed the industry. It took a few years to even realize it was happening but by the time it was obvious, it had changed to such a degree that huge companies found themselves in financial distress. This chart illustrates the effect. How did large, powerful, smart companies let this happen? It happened despite having a clear, front row view of the transition of the industry from mobile voice to mobile computing. The shift in the basis of competition from “connecting people” to “connecting people to data” ended up being a classic disruptive trap. Many will argue that it was the failing of individual managers. Perhaps, but how did they conspire to fail simultaneously? When you see disruption happening, it’s natural to seek out a cause, a pivotal magical “force” or event that enabled the weak to humble the strong–the proverbial sling that enabled David to defeat Goliath. My hypothesis is that The Primary Cause for the shift of profits from Incumbents to Entrants has been the disruptive impact of a new input method. I illustrated this with the help of the January 2007 slide presented by Steve Jobs at the launch of iPhone. 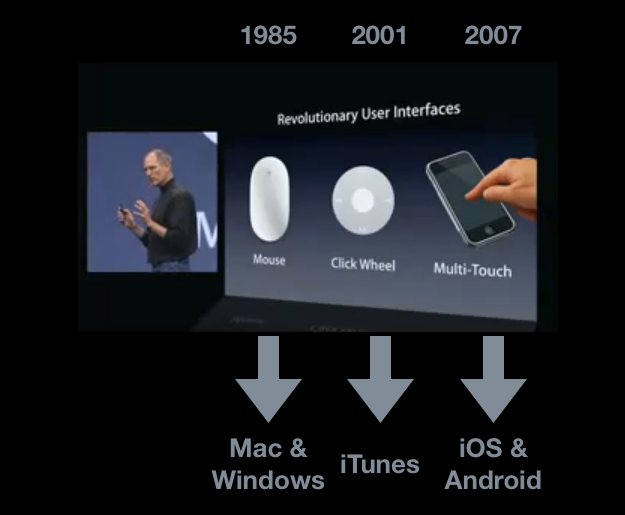 Each new input method led to not just a disruption but new platforms and new business models. Each new “sling” victimized a set of historic companies. 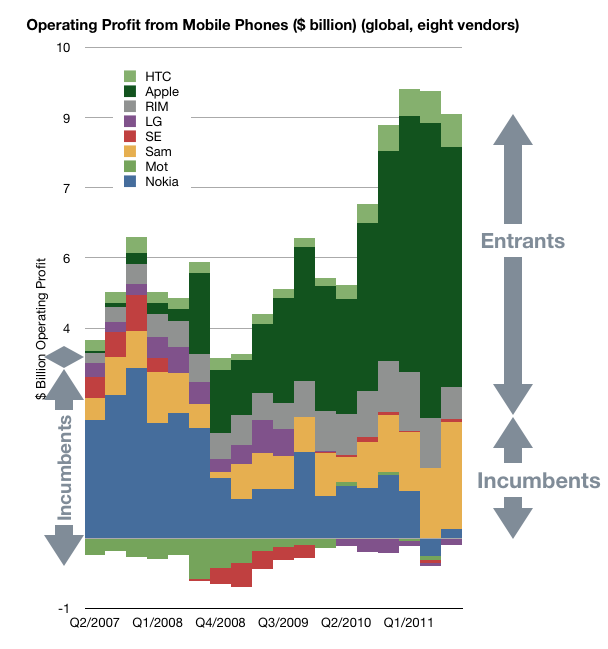 Mainframe and minicomputers, consumer electronics giants and now telecoms. Just like David’s sling, these technologies are not powerful in and of themselves, but rather, the way they are used makes them unpredictably sinister. The context of using capacitive touch on a handheld device rather than on a table-top makes it disruptive. Coupling it with high-speed mobile networks and powerful but efficient microprocessors made it into a force. That is now ancient history. The consequences and repercussions are still being felt and weighed, but the smart money should be focusing on the next shift. From the time frame in the diagram above, it’s clear that the cycle time between “Revolutionary User Interfaces” is shrinking. It’s been five years since multi-touch. Is the next “RUI” already here? Is Siri the next RUI? 4. It does not need a traditional, expensive smartphone to run but it uses a combination of local and cloud computing to solve the user’s problem. 5. It is, in a word, asymmetric. My disruptive hypothesis for Siri is that it shifts the competition from platforms positioned on a device to a “coupled” super-platform dependent on broadband and infrastructural computing. Just after collecting enough data and observing patterns in it that give us clarity, It looks like things are about to change all over again.